Pirkei Avot, often shortened to merely Avot, is a chapter of tractate Nezakin (Damages) of the Mishnah, the Oral Law of Judaism. It contains six chapters1, which are traditionally studied one chapter per week during the counting of the Omer, and then continue again at a slower pace until Sukkot (Tabernacles). So, why is studying Avot important? First, because it’s just good wisdom and we can all use more wisdom. But secondly, because the words of Jesus predate nearly all of the wisdom sayings found within this work, and yet you can almost hear his voice in the majority of these sayings. And though studying these comparatively with the words of our Master, I think we can gain some insight and understanding into his teachings which may have eluded us. Lastly, I find one of the most important reasons to study Avot is that many often spend a considerable amount of time learning the text and meaning of Scripture, but fail in the application. The main focus on Avot (and all of Jewish theology for that matter) is application. Comparing the straight forward instructions of Avot with the sometimes broad strokes of Yeshua’s teachings can sometimes really help in understanding practical application of the Master’s imperatives. Every Wednesday morning I meet with three other men for fellowship & to discuss the things we are learning, studying, etc. Over the last couple of weeks we have been discussing Avot, based on Twerski’s work. So far, we’ve gotten through the first three sayings of the first chapter. Yes, it’s that engaging. It’s been a wonderful time of digging into this text and then into the words of our Master to see how they compare and if we can learn something new and applicable to our lives. In regard to Avot commentaries, there are a plethora of commentaries available from various sources. This commentary by Twerski, however, is personally significant in that it seems to contain the kind of analogies which really drive home the message of each particular mishnah (segment of text, similar to a verse). He is a natural maggid (story teller), and includes an enormous amount of talmudic anecdotes & chassidic stories to illustrate his points for each mishnah. Some Messianics might take issue with his constant affinity with psychological principles or kabbalistic insights. However, I find them very stimulating and accessible. As far as illustrating Twerski’s methods, time permits me to give only one example. Yehoshua ben Perachyah says: Make a teacher for yourself; acquire a friend for yourself; and judge everyone favorably. If we are flexible and lenient with other people, then God is lenient to us. If we are stern, rigid, and demanding, then God will act accordingly with us. When we judge other people favorably rather than condemn them, we merit that God will judge us favorably as well. So, why should we judge others favorably? Why not judge them with the measure they “deserve”? Because we will be judged in like manner, according to our Master. If we fail to identify our own shortcomings, we are likely to see them in others and be critical of them. If we acquire a teacher and friend that can alert us to our own biases and allow us to be more impartial in our judgments, we are far less likely to be condemning of others. This is the essence of Yeshua’s instructions, and the extension of the mishnah at hand. Twerski does a great job at digging to the heart of the mishnah and looking at both the broad and specific applications time after time throughout the book. 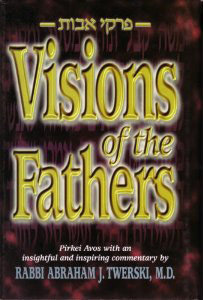 I would definitely be interested to hear any other specifics as to what you have enjoyed from Visions of the Fathers if you want to post a note for me in the comments. If you haven’t read it yet, you can pick up a copy here.